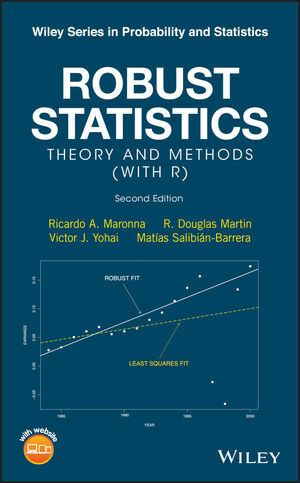 A new edition of this popular text on robust statistics, thoroughly updated to include new and improved methods and focus on implementation of methodology using the increasingly popular open-source software R.
Classical statistics fail to cope well with outliers associated with deviations from standard distributions. Robust statistical methods take into account these deviations when estimating the parameters of parametric models, thus increasing the reliability of fitted models and associated inference. This new, second edition of Robust Statistics: Theory and Methods (with R) presents a broad coverage of the theory of robust statistics that is integrated with computing methods and applications. Updated to include important new research results of the last decade and focus on the use of the popular software package R, it features in-depth coverage of the key methodology, including regression, multivariate analysis, and time series modeling. The book is illustrated throughout by a range of examples and applications that are supported by a companion website featuring data sets and R code that allow the reader to reproduce the examples given in the book. Unlike other books on the market, Robust Statistics: Theory and Methods (with R) offers the most comprehensive, definitive, and up-to-date treatment of the subject. It features chapters on estimating location and scale; measuring robustness; linear regression with fixed and with random predictors; multivariate analysis; generalized linear models; time series; numerical algorithms; and asymptotic theory of M-estimates. Robust statistics research results of the last decade included in this 2nd edition include: fast deterministic robust regression, finite-sample robustness, robust regularized regression, robust location and scatter estimation with missing data, robust estimation with independent outliers in variables, and robust mixed linear models. Robust Statistics aims to stimulate the use of robust methods as a powerful tool to increase the reliability and accuracy of statistical modelling and data analysis. It is an ideal resource for researchers, practitioners, and graduate students in statistics, engineering, computer science, and physical and social sciences. Note: sections marked with an asterisk can be skipped on first reading.